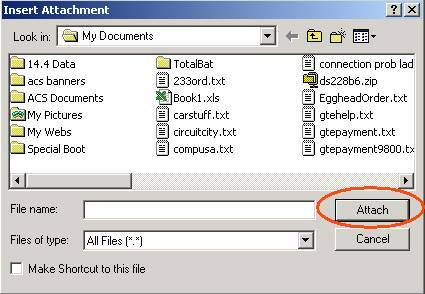 To send an attachment using Outlook Express, click on the New Mail button. Go ahead and type in the person's e-mail address. Click on the Attach button. Now this part will show how well you organize your files. Hopefully you won't have to search very hard to find the thing that you're trying to attach. Pick the file you want, then click the Attach button. You should make sure that the file is under 500k unless you like waiting a long time for it to upload. Finish your message, then click Send. It's that easy!